Laser Hair Removal is a quick, non-invasive way to permanently reduce unwanted hair. 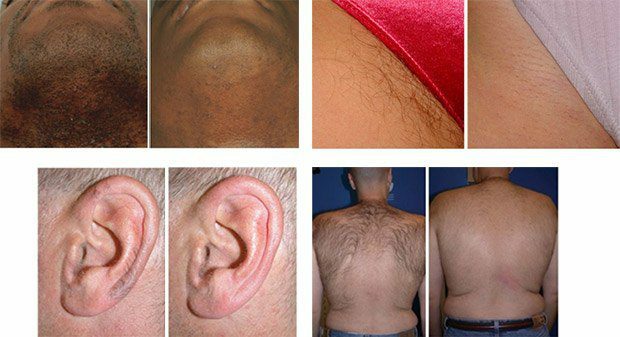 Unlike other common methods of hair removal, like shaving, depilatory creams, waxing, tweezing, laser treatments produce effective and lasting results. Cahaba Dermatology has chosen a excel HR™ from Cutera as a hair removal laser. From the pioneer and leader in aesthetic laser technology, excel HR™ offers the most advanced premium hair removal solution for all skin types. Combining Cutera’s proven long-pulse 1064 nm Nd:YAG laser and a new high-power 755 nm Alexandrite laser with the superiority of sapphire contact cooling, excel HR redefines modern laser hair removal. The laser hair removal technology makes use of an invisible laser beam to penetrate the skin and remove the hair follicle from its root without harming the skin surface. The device locates the hair follicle by detecting Melanin. Melanin is the dark pigmentation in the hair. Once detected, the device directs laser energy at the hair root to destroy it. Multiple treatments, typically 4 to 6, spaced 4 weeks apart are needed to maximize your results. Once treatment is complete, there will be a significant reduction in the amount and thickness of hair growth and skin will remain smooth and hair free; any regrowth of hairs tend to be thinner and lighter. The area to be treated is cleansed and shaved by the patient at home the day before procedure. This helps minimize discomfort. A topical numbing cream may be applied. Dark, course hair responds better than fine, light hair. White hair does not respond at all to laser hair removal. Yes, this laser system is safe for all skin types. of the sun and use sunscreen. Over the next few weeks your hair will appear to grow as it falls out.